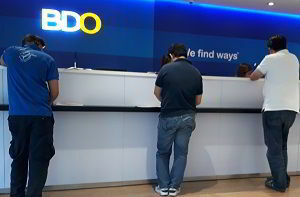 Is there BDO Kabayan savings account expiration? No, there's no BDO Kabayan savings account expiration. Your Kabayan account does not expire. There's no expiration date on your ATM card or on your passbook. But what can happen is that if you fail to comply with remittance rules, your Kabayan account will be converted into a regular savings account, and then later on closed. Why and when will a Kabayan savings account be converted into a regular savings account? It will be converted into a regular savings account after 24 months of no remittance into the account from abroad. Remember na hindi required ang maintaining balance sa Kabayan account kasi it was designed to attract OFWs. Ang requirement lang is dapat merong remittance from abroad at least once every 24 months. Starting October 1, 2018, na-extend na sa 24 months ang chance for BDO Kabayan account owners to remit from abroad at least once to their Kabayan accounts para ma-maintain ang account na Kabayan pa rin, na walang maintaining-balance requirement. At ibinaba na rin from 10,000 pesos to 2,000 pesos ang maintaining balance ng anumang account na hindi naka-remit from abroad after 24 months at na-convert into a regular savings account, at hindi na Kabayan ang account. So after 24 months of no foreign remittance, your Kabayan account will automatically be converted into a regular passbook savings account. This time, meron nang maintaining balance requirement na 2,000 pesos. This means na dapat meron kang 2,000 pesos sa account mo everyday as maintaining balance. Puede namang hindi everyday na andon yong 2,000 pesos basta lang sa ibang araw meron kang nakadeposit na more than 2,000 pesos at nang sa ganon, pag mag-compute na ang BDO ng average daily balance for the month, 2,000 pesos or more pa rin ang lumalabas na balance. I asked my relative to deposit money to my Kabayan account so it will remain a Kabayan account. Why was my Kabayan still converted into a regular account? Dapat remittance from abroad. Ang deposit over the counter or online money transfer from another BDO account ay hindi considered remittance from abroad. Why was my account closed after it was converted? It was closed because your balance was only 300 pesos or less. When the 300-peso penalty was deducted, your balance became ZERO or NEGATIVE, so automatically, your account was closed. Ang rule is: After 2 consecutive months that your account is below maintaining-balance status, your account will get a penalty of 300 pesos every month until your balance is used up, or until you restore it to good status. Once na naging zero o negative ang bank account, automatically ay nako-close ito. Naka-program yan, so automatic. Can I reactivate my closed account? BDO does not reactivate closed accounts. But you can open a new BDO account after 6 months. What are the licensed HMOs in the Philippines? Licensed by the Insurance Commission for the years 2017 to 2019. 2. Asiancare Health Systems, Inc.
3. Avega Managed Care, Inc.
4. Carehealth Plus Systems lnternational, Inc.
5. Carewell Health Systems, Inc.
6. Caritas Health Shield, Inc.
11. Getwell Health Systems, Inc.
14. Health Plan Philippines, Inc.
15. IMS Wellth Care, Inc.
16. Insular Health Care, Inc.
17. Kaiser lnternational Healthgroup, Inc.
18. Life & Health HMP, Inc.
19. Mazan Health Care, Inc.
21. Medicare Health Systems, Inc.
24. Metrocare Health System, Inc.
26. Pacific Cross Health Care, Inc.
28. Stotsenberg Healthcare System, Inc.
29. Transnational Medical & Diagnostic Center, Inc.
30. Ultima Health Systems, Inc.
31. Value Care Health Systems, Inc. The supervision and regulation of HMOs was transferred from the Department of Health (DOH) to the Insurance Commission by President Benigno S. Aquino III through Executive Order No. 192 on November 12, 2015. 1. Asian Care Health Systems, lnc. 3. Transnational Medical & Diagnostic Center, Inc.
1. Avega Managed Care, lnc. 5. Getwell Health Systems, lnc. 9. Metro Care Health Systems, lnc. 11. Philippine British Assurance Company, lnc. 12. Stotsenberg Healthcare Systems, lnc. 2. Carehealth Plus Systems lnternational, lnc. 3. Carewell Health Systems, lnc. 4. Caritas Health Shield, lnc. 7. Health Plan Philippines, lnc. 8. IMS Wellth Care, lnc. 9. lnsular Health Care, lnc. 10. Kaiser lnternational Healthgroup, lnc. 11. Life & Health HMP, lnc. 12. Medocare Health Systems, lnc. 13. Pacific Cross Health Care, lnc. 15. Value Care Health Systems, lnc. The IC has advised the public that MCN Global Holding Corp. also known as Goldmed has not been issued a license by the IC to operate as an HMO. Based on above DOH list, Goldmed has not also been issued a license by the DOH to operate as an HMO. Can I Transfer Money Online from BPI to BDO and Other Banks? As of today, you can not yet transfer money online from BPI to BDO and to other banks. But BPI says that SOON, you can transfer funds from BPI to BDO and to other banks through INSTAPAY and PESONET. Most probably, BPI has not yet completed the integration of Instapay into its system, so we wait. We also wish that BPI will impose a lower transfer fee, lower than 100 pesos, which is the amount charged by BDO to transfer money via Instapay. Based on the list of InstaPay transfer fees published by the BSP, BDO charges the highest fee. Others charge only 10 pesos and 15 pesos. Landbank, Metrobank, PNB Savings Bank, Robinsons, and UCPB charge 25 pesos. PNB charges the second highest fee, which is 50 pesos. While you cannot yet transfer from BPI to BDO and to other banks, BPI is able to receive transfers from BDO and other banks via Instapay. And it does not impose a receiving fee. The transfer is also in real time, instantly, as long as the transfer from the other bank is successful. InstaPay is an electronic fund transfer (EFT) service that allows account owners to transfer peso funds instantly between accounts of participating BSP-supervised banks and non-bank e-money issuers in the Philippines. The service is available 24/7, any day, any time. InstaPay is supervised by the Philippine Payment Management Inc. (PPMI) under the oversight of the Bangko Sentral ng Pilipinas. The PPMI was established by Philippine banks in 2017 through the Bankers Association of the Philippines (BAP) to help the BSP implement an interconnected electronic retail payment system in the country. InstaPay is primarily for consumers, as the maximum amount that can be transferred per day is 50,000 pesos. PESONET is primarily for fund transfers by businesses. Transfers are not instant, but funds are credited within the day, as long as they are received prior to cut-off periods. How Much Is My SSS Lump Sum if I Don't Qualify for Pension? How much Lump Sum will you Get from SSS if you are not qualified for pension? Your SSS Lump Sum is equal to your total SSS monthly contributions plus Interest. Lahat ng ibinayad mong contributions sa SSS pati lahat ng ibinayad ng employers para sa iyo ay ito-total ng SSS, saka idadagdag yong total interest na kinita ng mga contributions mo. Why Am I Not Qualified for Pension? You were not able to accumulate a total of 120 valid monthly contributions when you turned 60 years old. Are There Other Benefits That I Can Get from SSS After I Have Claimed My Lump Sum Benefit? The only benefit left is your Funeral Benefit. But it will not be you who will claim. It will be your heirs who will claim your Funeral Benefit after you pass away. Can I complete the required 120 monthly contributions so that I can qualify for pension even if I'm already 60 years old? Yes, you can. But you must be able to accumulate a total of 120 valid contributions prior to your semester of retirement at age 65. 65 years is the age for mandatory SSS retirement. What do you mean by "VALID Contributions?" Contributions are valid if your first-ever monthly contribution was VALID. or if you registered as Non-Working Spouse and your registration was approved. One indication that your contributions are VALID is if you have a DATE of COVERAGE. You can see this Date of Coverage in your online SSS account. 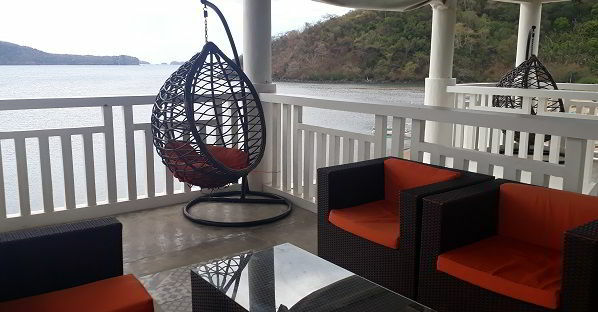 Can you tell me one cheap beach resort in Nasugbu Batangas for a day tour? 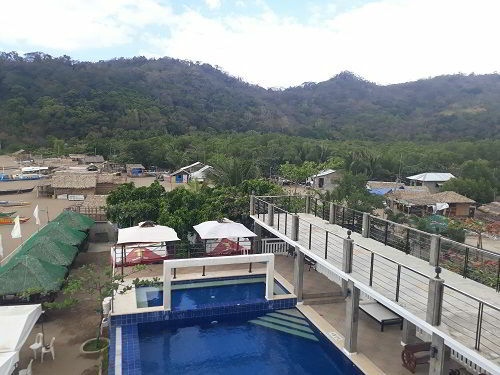 One cheap beach resort in Nasugbu, Batangas for a day tour is Calayo Green Terrace located in the community of Calayo, Nasugbu, Batangas. I'm referring only to the day tour rates. It's 250 pesos per person. Day tours are from 8am to 5pm. Tents are rented for 1,000 pesos; nipa huts are rented for 1,500 pesos. View from the north side of main building's 3rd floor. We rented one of the 4 huts. 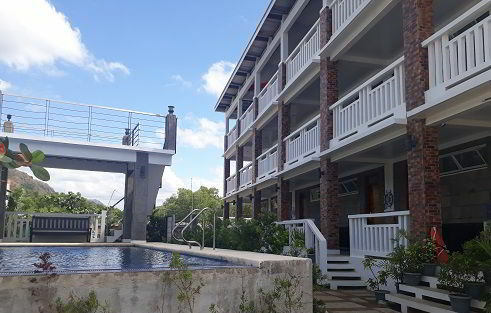 For me, the rooms are not cheap (4,000 to 6,000 pesos per night for 4 persons, but compared to other beach resorts in Batangas that charge nearly 10,000 pesos per night, then this beach resort is affordable. 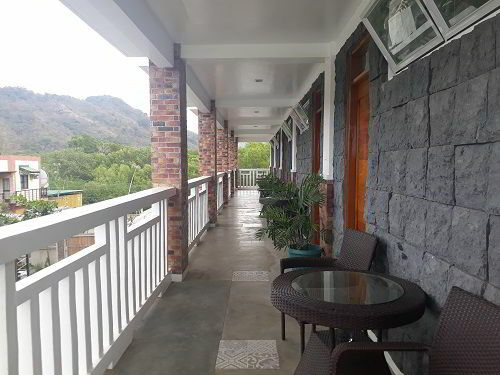 When we went to this resort on February 12, 2019, we were the only guests on day tour. We were seven persons. There were no checked-in guests, so we had the resort all to ourselves. We had a great time. We paid 250 pesos for each person (day tour fee) and 1,500 pesos for the nipa hut. A total of 3,250 pesos for 7 persons. What did we do? We swam, we played volleyball, we sang our hearts out (they have a 5-peso-per-song karaoke), we danced, and we ate our baon, and some took naps. There are barbecue grills near the huts, but we didn't use them, as we forgot to buy fish on the way. There are some fishermen tending to their boats, but they said they've sold their fresh catch earlier that day. We also took some time taking in the views all around at the 3rd floor of the building, and enjoyed sitting on their beautifully woven swings. They have two. Lounge, 3rd floor. Their restaurant is also on the 3rd floor. 1. They offer day tours; many other resorts do not. 2. The property is on the beach, so you're already on the beach. You don't have to walk far to go to the beach. 3. You can bring your own food; you can cook your own food. Even checked-in guests can cook their own food, they only have to rent a nipa hut or tent so they can use a barbecue grill. 4. It's nearer to Metro Manila, about 2 hours of driving from Alabang via the Governor's Drive-Nasugbu-Ternate Highway-Kaybiang Tunnel route. 5. The 3rd floor of the building offers you great views of the beach, the cove, the mountains, the boats and properties in the area. 6. Because the beach is located in a cove, the sea is calm, the shallow portions are wider, so it's safer for kids and senior citizens. 7. The resort is beside MB Cove which operates an inflatable playground. The charge is 300 pesos for 2 hours of fun. 8. If you take the Nasugbu-Ternate Highway, you pass by awesome sights, including the Kaybiang Tunnel and portions of the Mount Palay-Palay National Park. I'm glad to know that it's a protected area of nearly 4,000 hectares and maintained by the DENR. You'll be amazed that there's such a lush rainforest near Metro Manila. The winding sloping mountain highway is also a sight by itself, as it's well-maintained, and you'll admire the tricycles that easily navigate the mountainous road. 1. The sand is not white; it's light brown. The good thing about it is you can look at the sand for a longer time without hurting your eyes. 2. There's only one day-tour shower room for ladies and one day-tour shower room for men. Two restrooms for ladies and two for men. It was okay for us that day, as we were the only guests. Imagine if there were a lot of day tour guests. 3. If you want to see the open sea and the west horizon, you cannot, as the beach is in a cove, bounded by two small mountains. You can hire a boat though, to visit nearby islands and see the open sea. Price starts at 1,500 pesos for a group for 4 hours. 4. If you want to see waves, sorry, I don't even remember if there were waves haha. The location is a relatively big cove, so the water is super calm. 1. Make sure your vehicle is in good condition, as the roads to Calayo slope up and down. If you take the Nasugbu-Ternate mountain highway, it must be so scary if your vehicle suddenly breaks down and there are no other vehicles passing by. 2. Know other resorts that you can go to in case this resort is already filled with guests when you arrive. 3. I think if your group is the adventurer type, and not so particular on easy comfort, you can enjoy the public beaches of Calayo without staying in a resort. Enter the southern entrance to the Calayo beach, park your vehicle somewhere temporarily, then look for huts that are being rented out, then ask where it's safe to park your vehicle. 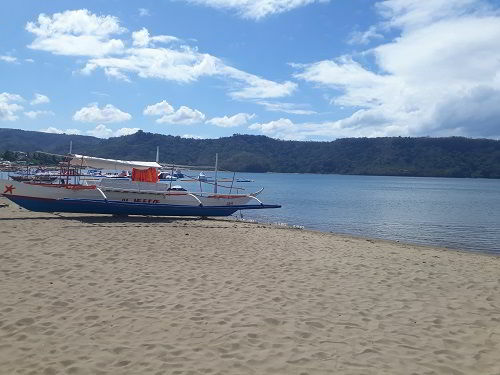 If you find a hut that also has a makeshift restroom and freshwater for showering, then it would be like you've found the cheapest beach resort in Nasugbu Batangas for a day tour. You can use Waze in areas you're not familiar with. I think it's the Globe network that works in most parts of the area. The resort uses a Globe number, so I used my Globe number. When we traveled to the resort, we took the SLEX-Sta. Rosa-Tagaytay-then-Tagaytay-Nasugbu Highway route. When we traveled back home, we took the Kaybiang Tunnel-Nasugbu-Ternate Highway-Governor's Drive route. The Calayo Green Terrace guard said this route is shorter and that we can also see the tunnel and the rainforest. See Calayo Green Terrace's "Getting There" guide.